Knot Body is the second part in the ROPE series and is revealed in the moment we experience a body entangled in a 500m long rope. What happens when the body becomes a knot and the knot a body? QUARTO’s attention lies in the experimentation between a body and a long rope – rope-body, node-body, entangled-body, knot-body – as an attempt to escape from the body’s/object’s daily attributes and give them an unsuspected meaning, beyond the understanding of a representative body/object relation. Thereby, what is provoked with the entanglement of the knot intends to abandon some recognisable forms, movements and choreographic scores that have been dominant, while dealing with an object that is one of the oldest and most important inventions of mankind: the rope, the knot. Knot Body seeks to produce spaces, images and fragments where the limit between body and knot is vague; precisely in this place, we witness the creative potentiality of the body/object through liberating it from its social representations. Reminding us of the endless layers and complexities of the contemporary nodes we are entangled in today, in various spheres, economical, political, ecological, social and ethical, both personal and collective knots that intertwines and connects us all. QUARTO has developed, in the past 14 years, bodies of work that unfold in series within long-term interdisciplinary research. The current is the ROPE series where each part deals with a long rope in distinct ways. 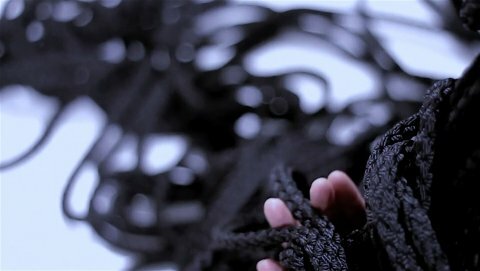 The first part Beauty of Accident explored the rope’s flux and continuous movement; it unfolded into a durational piece and video piece. 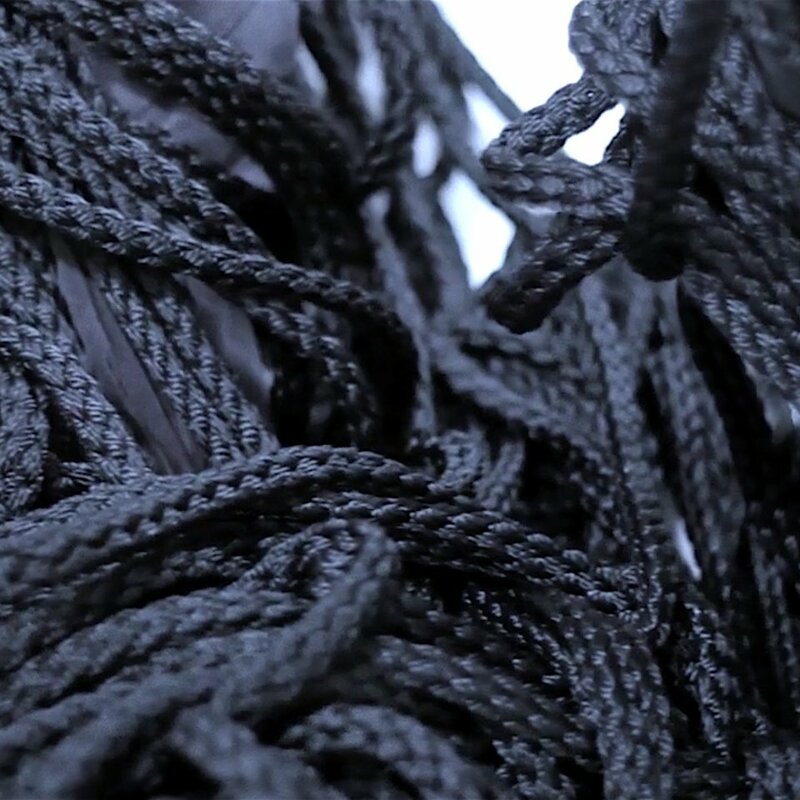 In the second part, Knot body, the performance piece deals with the rope as a knot/mass/body and has also unfolded into a video piece and an installation piece that will premiere in autumn 2017. The ticket office opens at 18:00 in the foyer. The film is looping in studio 1 between 18:00 and 19:00 and is app. 20 minutes long. 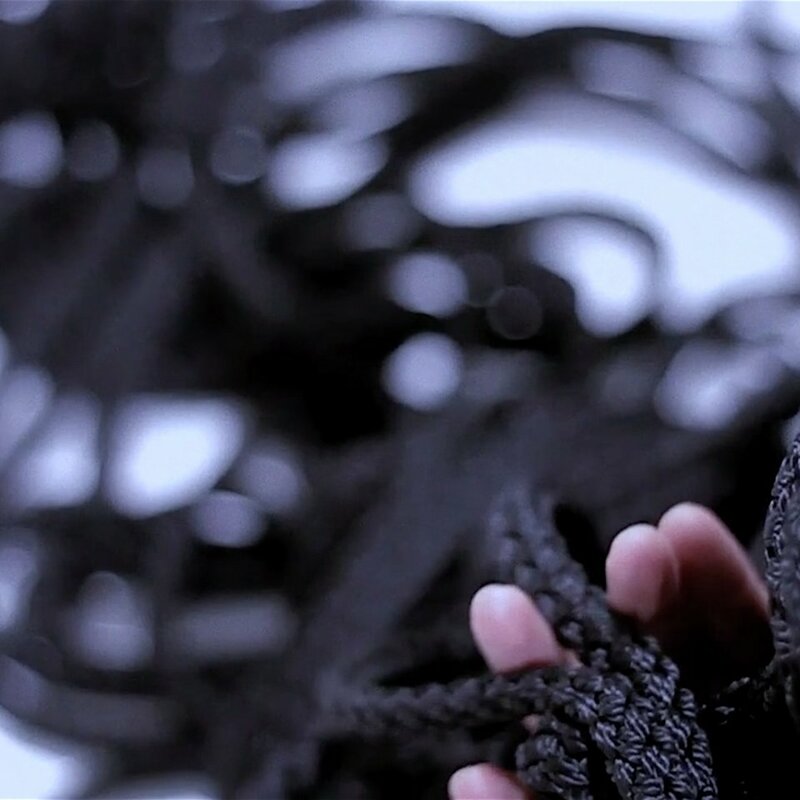 A choreographic video piece exploring the limits between knot and body unfolded from the performance piece KNOT BODY. 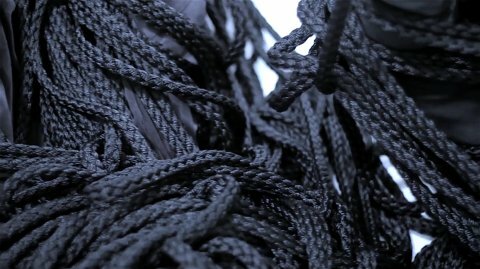 The metamorphoses of a black 1000-metre-long rope: a pile, a lasso, a whip, a snaky line, and then a huge knot, an unknown pattern; an unforeseen ornament between ground contact and vertical tension becomes a huge mass entwining the body. The rope is an object that simultaneously fills and measures the space, a mutable instrument that becomes the body, hides the body and reveals the body. The blackness of the rope in contrast to the skin of the naked body executes an animistic ritual, which seems to imbue a utilitarian object with movement energy, awakening its own inner life. A contemplative exploration of the dynamic relationship between object and subject. Created together with Anna af Sillén de Mesquita & Leandro Zappala and the video artist Palle Lindqvist. It was filmed under artistic residence at MDT during 2016 and is co-produced by MDT and the Cullberg Ballet and is part of the framework of the “Life Long Burning” programme supported by the European Union and the Cullberg Ballet through the Culture Programme 2013-2018. The video will be looped in studio 1 between 18:00-19:00 and after the performance and talk. Free entry, no reservation required. We invited the philosopher Marcia Sá Cavalcante Schuback to reflect from/through the work as a choreographed extension of resonance translated into words. She has been collaborating with QUARTO since 2014, following and in dialogue with the artistic process ever since. Marcia is a specialist in German idealism, contemporary philosophy and aesthetics. Professor of philosophy at Södertörn University in Sweden, she is the translator of Martin Heidegger’s Being and Time into Portuguese. She is also the author of ten books and numerous articles touching upon themes in phenomenology, existentialism, hermeneutics, and political thought. After the performance on Friday. Available as text on Saturday. QUARTO is an artist duo founded in 2003 by Anna af Sillén de Mesquita and Leandro Zappala. QUARTO exists as an interdisciplinary platform. Based in Stockholm they live between Brazil and Sweden collaborating with other artists, researchers, academics and institutions devoted to research and development in the art field. Choreography & Concept: Leandro Zappala & Anna af Sillén de Mesquita. Performance: Leandro Zappala. Light: Daniel Goody & QUARTO. Sound: Palle Lindqvist. Manager: Koen Vanhove. This project is co-produced by MDT, Inkonst and the Cullberg Ballet and is part of the framework of the “Life Long Burning” programme supported by the Culture 2013-2018 Programme of the European Union and the Cullberg Ballet. Developed in artistic residence at: Uferstudios Berlin (Through The Swedish Arts Grants Committee’s International Programme for Dance Artists), MDT Stockholm, Inkonst Malmö and Cullberg Ballet. Supported by: The Swedish Arts Council, Stockholm’s Culture Committee, The Stockholm County Council and The Swedish Arts Grants Committee.